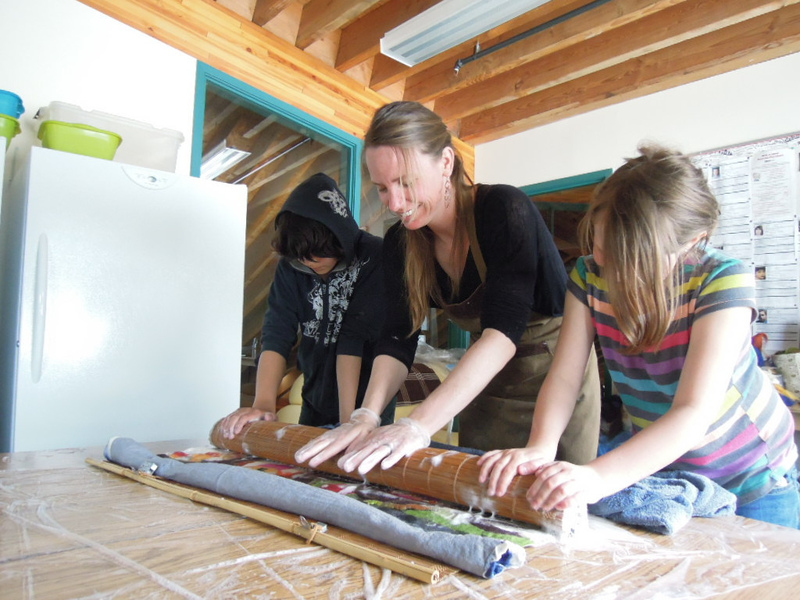 An eight-week long art project with four classes, from Kindergarten to Grade 7 at Sk'aadgaa Naay Elementary School in Skidegate, BC. Sk’aadgaa Naay Elementary School is surrounded by forests and a trail that leads to old growth Cedar and Spruce trees and an eagle nest. 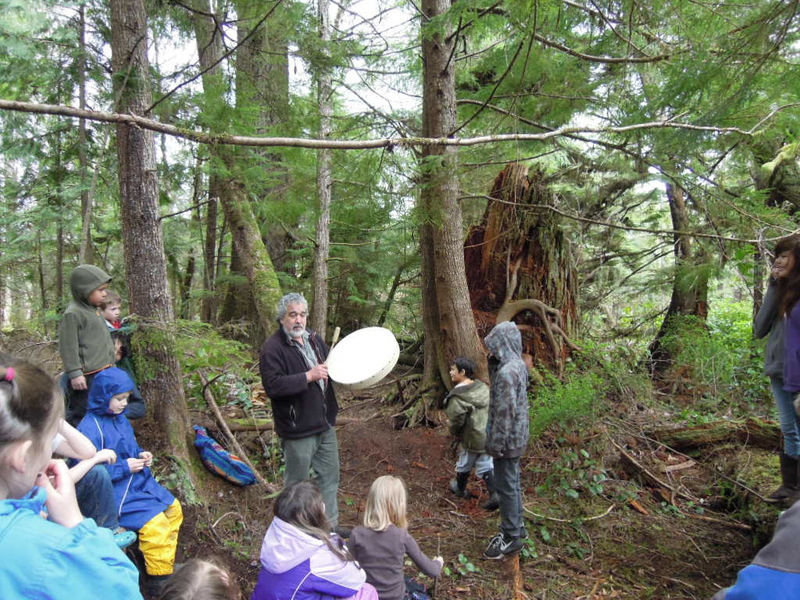 This area formed the inspiration for the Giving Trees of Haida Gwaii project, where young students learned about the social and cultural importance of the trees of the surrounding rainforest. 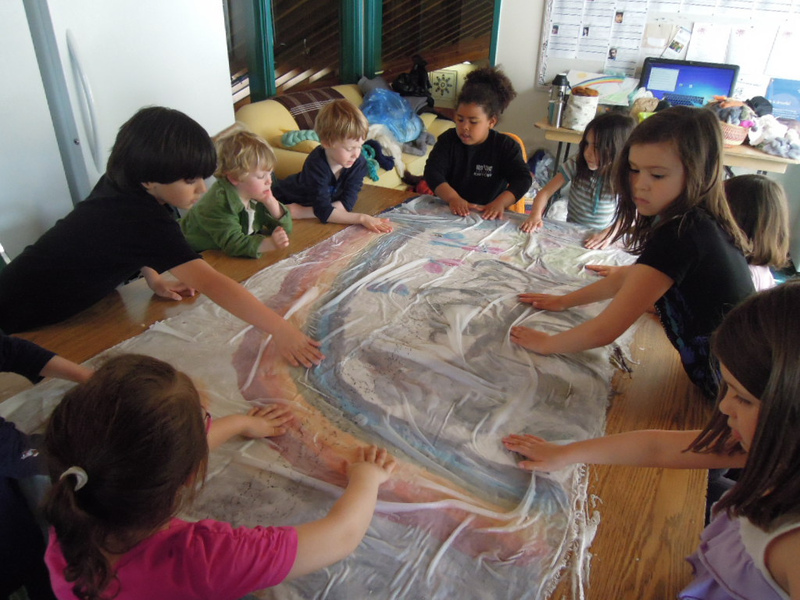 This learning inspired the creation of collaborative art projects. 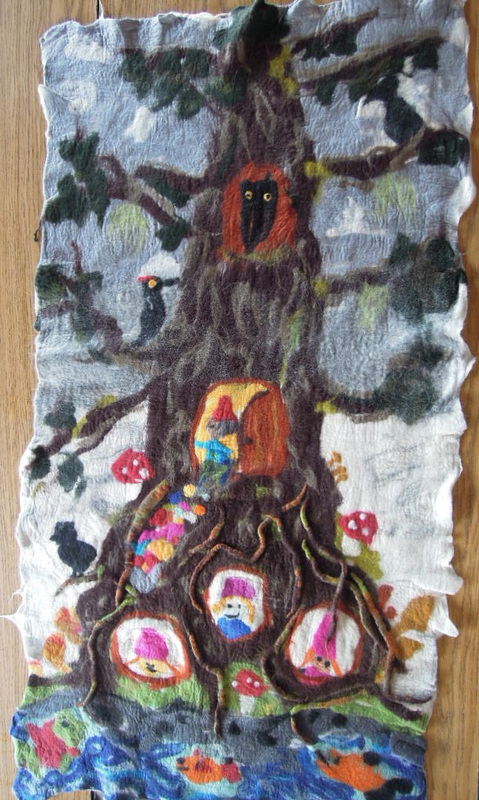 Each class was assigned a tree to work with for the period of the art project. 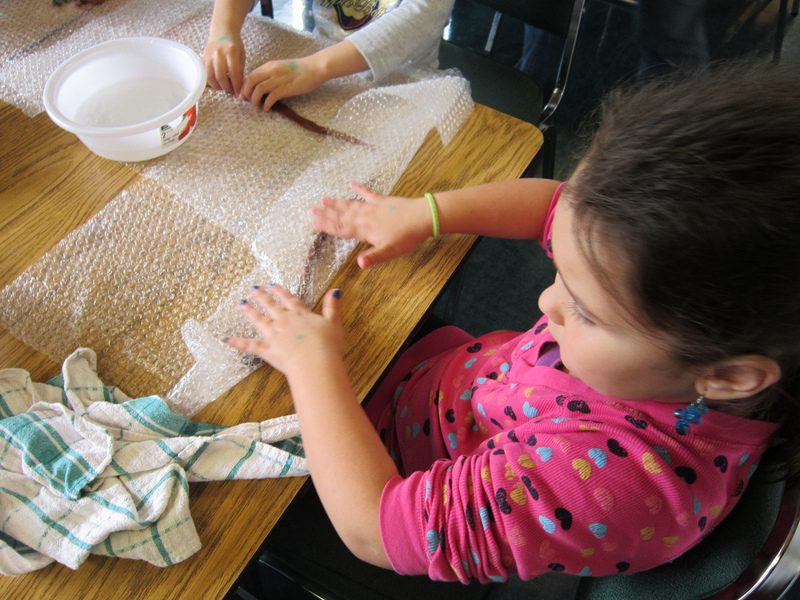 Miss Karrow’s Kindergarten class worked with the Western Red Cedar tree. 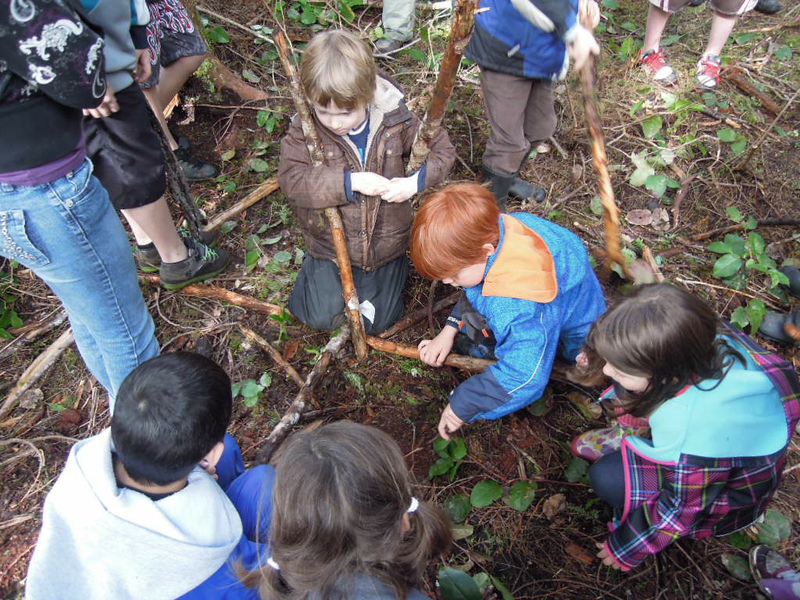 Miss Jung’s Grade 1 class learned about the Sitka Spruce tree. Mr. Lagasse’s Grade 4/5 class explored Western Hemlock and Mr. Reid’s Grade 6/7 class used the Red Alder tree as their focus. The project had many elements to inspire the creative process. 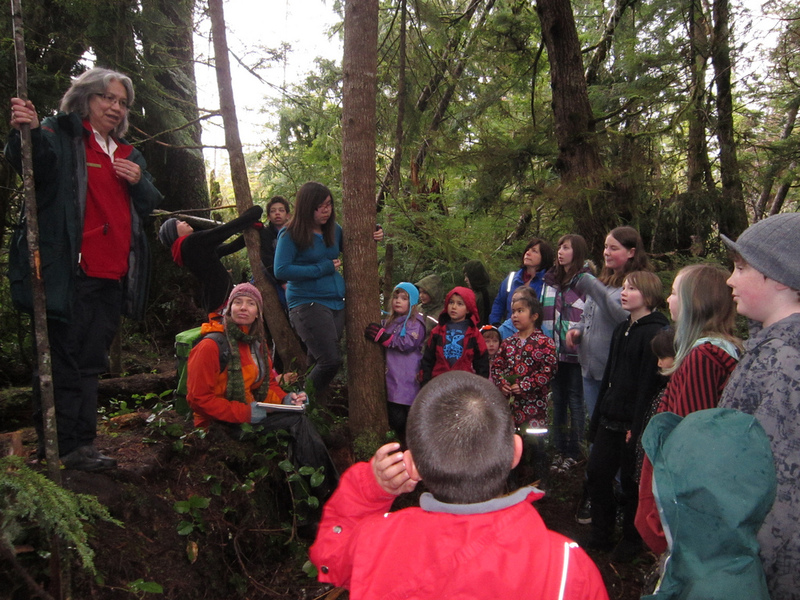 Students learned about native uses and life cycles of the trees on a guided hike by Linda Tollas, Interpretation Officer at Parks Canada. They learned how the trees are part of an unbroken, interdependent circulation of water, air, plants and beings. 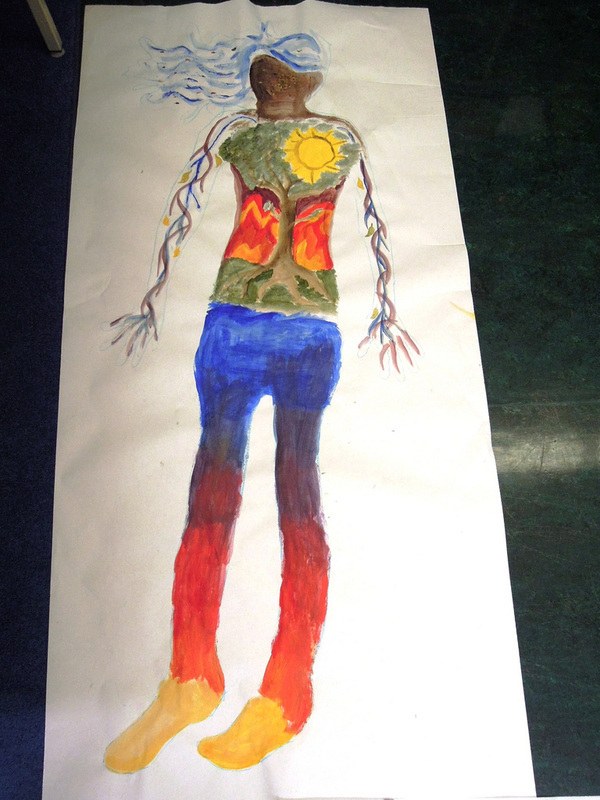 We learned about medicinal and cultural uses of the four trees and their co-habitants. 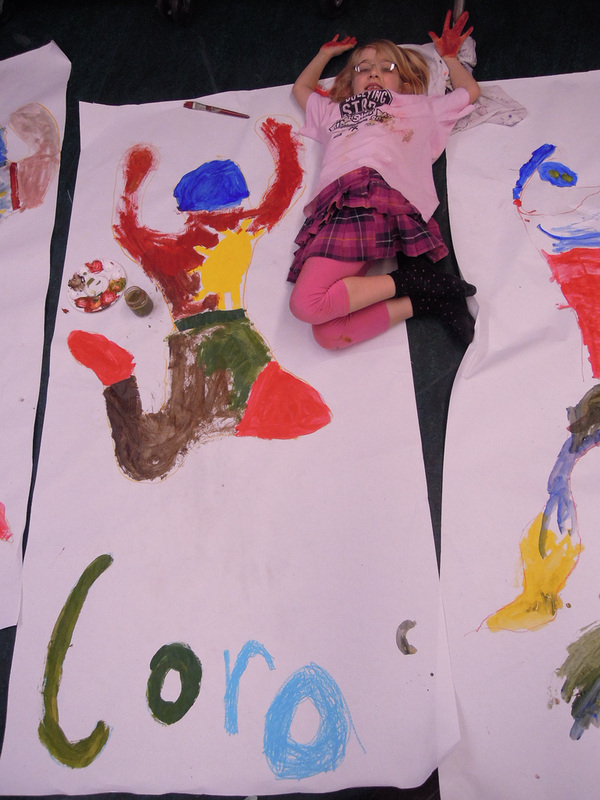 Following this, we looked at how we are connected to the earth by creating large scale paintings of ourselves, bringing the natural world into our bodies. Yoga and meditation practices were used throughout the sessions to warm up and awaken the creative process, as well as quiet busy mental chatter. We returned to the forest to listen to Guujaaw's Haida stories, drumming and songs, and to the songs of the birds and the silence of nature. We touched and smelled the dirt, the caterpillars, bark, ferns, and marvelled at nature's art. 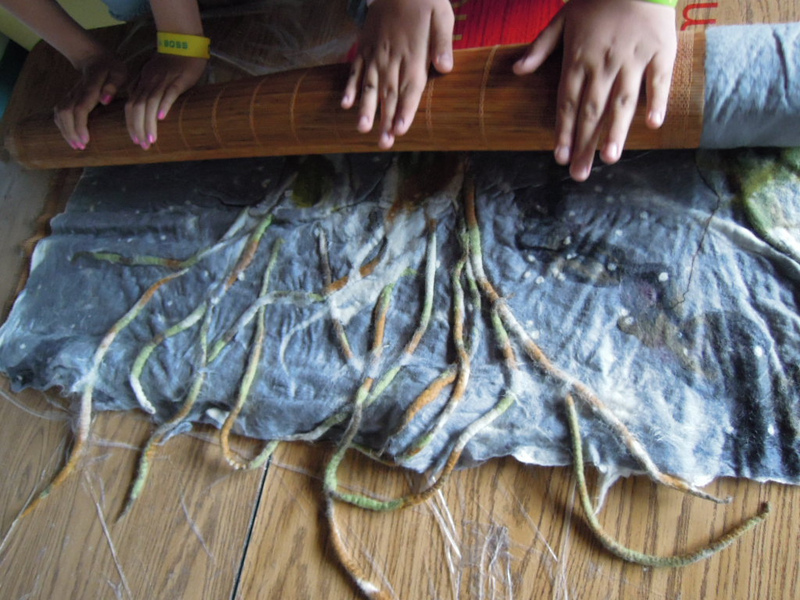 We learned to create felt seeds and roots for our trees. We created sketches of stories for our trees. 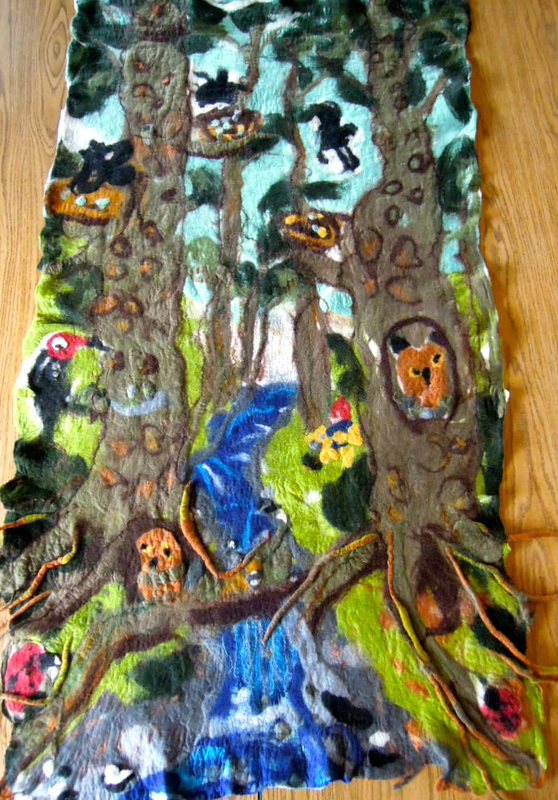 We created flat felt details of ladybugs, flowers, gnomes, and bark patterns. 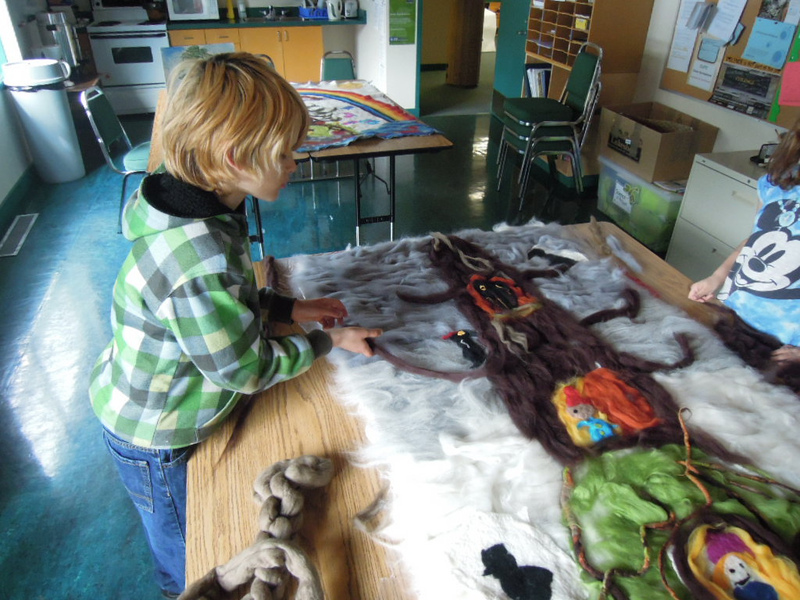 These then became incorporated into the final project - large 3' x 5' felted pieces representing the trees chosen by the class. 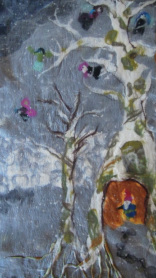 These works were exhibited at the school, and also as part of the "Sense of Place" exhibit at the Artstarts gallery in Vancouver from September 2012 to March 2013. 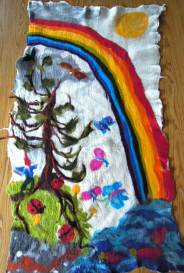 For more details on the project and photographs, please visit the "Giving Trees of Haida Gwaii" post on my blog.